How the fork in the picture was bent...? This is totally different fork bending!! 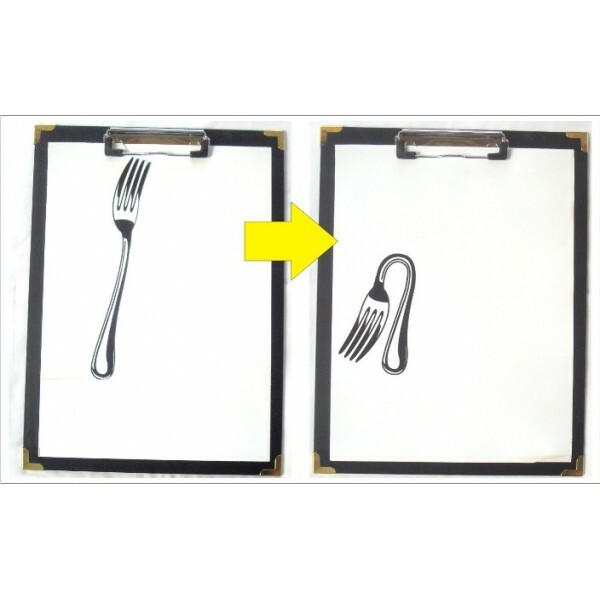 There is an illustration of a fork on a paper which is put on a clipboard. Magician picks a volunteer from the audience and have him/her write his/her name or something like that to make the illustration the only original one in the world. Magician takes off the paper from the clipboard, turn it face down and bend it. Then, when you open the paper again, the audience will see the bent fork which was originally straight. Of course, there is nothing else other than the paper with the illustration of a fork on the clipboard. The paper is able to give audience after show. The clipboard is able to be shown to audience clearly. *Comes with a gimmick and 10 papers. 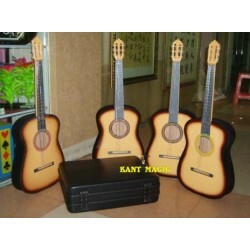 Four Appearing Guitars From Suitcase An absolutely astonishing appearing act where you appear not O..